Map of proposed prehistoric migrations of Y chromosome bearing humans according to the recent African origin of modern humans theory. In human genetics, a human Y-chromosome DNA haplogroup is a haplogroup defined by mutations in the non-recombining portions of DNA from the Y chromosome (called Y-DNA). Mutations that are shared by many people are called single-nucleotide polymorphisms (SNPs). The human Y-chromosome accumulates roughly two mutations per generation. Y-DNA haplogroups represent major branches of the Y-chromosome phylogenetic tree that share hundreds or even thousands of mutations unique to each haplogroup. The Y-chromosomal most recent common ancestor (Y-MRCA, informally known as Y-chromosomal Adam) is the most recent common ancestor (MRCA) from whom all currently living men are descended patrilineally. Y-chromosomal Adam is estimated to have lived roughly 236,000 years ago in Africa. By examining other bottlenecks most Eurasian men are descended from a man who lived 69,000 years ago. Other major bottlenecks occurred about 5,000 years ago and subsequently most Eurasian men can trace their ancestry back to a dozen ancestors who lived 5,000 years ago. Schematic illustration of Y-DNA haplogroups naming convention. 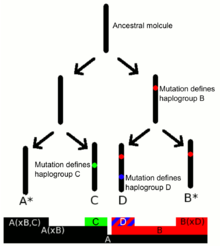 Haplogroups are defined through mutations (SNPs). Y-DNA haplogroups are defined by the presence of a series of Y-DNA SNP markers. Subclades are defined by a terminal SNP, the SNP furthest down in the Y-chromosome phylogenetic tree. The Y Chromosome Consortium (YCC) developed a system of naming major Y-DNA haplogroups with the capital letters A through T, with further subclades named using numbers and lower case letters (YCC longhand nomenclature). YCC shorthand nomenclature names Y-DNA haplogroups and their subclades with the first letter of the major Y-DNA haplogroup followed by a dash and the name of the defining terminal SNP. Long time customers of Family Tree DNA have seen the YCC-tree of Homo Sapiens evolve over the past several years as new SNPs have been discovered. Sometimes these new SNPs cause a substantial change in the "longhand" explanation of your terminal Haplogroup. Because of this confusion, we introduced a shorthand version a few years ago that lists the branch of the tree and your terminal SNP, i.e. J-L147, in lieu of J1c3d. Therefore, in the very near term, Family Tree DNA will discontinue showing the current "longhand" on the tree and we will focus all of our discussions around your terminal defining SNP. The defining mutations separating CT (all haplogroups except for A and B) are M168 and M294. The site of origin is unknown but likely in either Asia or Africa approximately 88,000 years ago. A hypothetical diversion of Haplogroup F and its descendants. The groups descending from haplogroup F are found in some 90% of the world's population, but almost exclusively outside of sub-Saharan Africa. F xG,H,I,J,K is rare in modern populations and peaks in South Asia, especially Sri Lanka. It also appears to have long been present in South East Asia. has been reported at rates of 4–5% in Sulawesi and Lembata. One study, which did not comprehensively screen for other subclades of F-M89 (including some subclades of GHIJK), found that Indonesian men with the SNP P14/PF2704 (which is equivalent to M89), comprise 1.8% of men in West Timor, 1.5% of Flores 5.4% of Lembata 2.3% of Sulawesi and 0.2% in Sumatra. F* (F xF1,F2,F3) has been reported among 10% of males in Sri Lanka and South India, 5% in Pakistan, as well as lower levels among the Tamang people (Nepal), and in Iran. F1 (P91), F2 (M427) and F3 (M481; previously F5) are all highly rare and virtually exclusive to regions/ethnic minorities in Sri Lanka, India, Nepal, South China, Thailand, Burma, and Vietnam. In such cases, however, the possibility of misidentification is considered to be relatively high and some may belong to misidentified subclades of Haplogroup GHIJK. Haplogroup G (M201) originated some 48,000 years ago and its most recent common ancestor likely lived 26,000 years ago in the Middle East. It spread to Europe with the Neolithic Revolution. It is found in many ethnic groups in Eurasia; most common in the Caucasus, Iran, Anatolia and the Levant. Found in almost all European countries, but most common in Gagauzia, southeastern Romania, Greece, Italy, Spain, Portugal, Tyrol, and Bohemia with highest concentrations on some Mediterranean islands; uncommon in Northern Europe. G-M201 is also found in small numbers in northwestern China and India, Bangladesh, Pakistan, Sri Lanka, Malaysia, and North Africa. Haplogroup H (M69) probably emerged in South Asia, about 48,000 years BP, and remains prevalent there, in the forms of H1 (M69) and H3 (Z5857). However, H2 (P96) has been present in Europe since the Neolithic and H1a1 (M82) spread westward in the Medieval era with the migration of the Romani. Haplogroup I (M170, M258) is found mainly in Europe and the Caucasus. Haplogroup I2 (P215) Found mainly in southeast Europe and Sardinia save for I2B1 (m223) which is primarily found in Western, Central, and Northern Europe. Haplogroup J (M304, S6, S34, S35) is found mainly in the Middle East and South-East Europe. Haplogroup J* (J-M304*) is rare outside the island of Socotra. Haplogroup J1 (M267) is associated with Northeast Caucasian peoples in Dagestan and Semitic languages speaking people in the Middle East, Ethiopia, and North Africa and also found in Mediterranean Europe in smaller frequencies much like haplogroup T.
Haplogroup J2 (M172) is found mainly in the Semitic-speaking peoples, Anatolia, Greece, the Balkans, Italy, Iran, the Caucasus, South Asia, and Central Asia. Haplogroup K (M9) is spread all over Eurasia, Oceania and among Native Americans. K(xLT,K2a,K2b) – that is, K*, K2c, K2d or K2e – is found mainly in Melanesia, Aboriginal Australians, India, Polynesia and Island South East Asia. Haplogroup L (M20) is found in South Asia, Central Asia, South-West Asia, and the Mediterranean. Haplogroup T (M184, M70, M193, M272) is found at high levels in the Horn of Africa (mainly Afro-Asiatic-speaking peoples), parts of South Asia, the Middle East, and the Mediterranean. T-M184 is also found in significant minorities of Sciaccensi, Stilfser, Egyptians, Omanis, Sephardi Jews, Ibizans (Eivissencs), and Toubou. It is also found at low frequencies in other parts of the Mediterranean and South Asia. The only living males reported to carry the basal paragroup K2* are indigenous Australians. Major studies published in 2014 and 2015 suggest that up to 27% of Aboriginal Australian males carry K2*, while others carry a subclade of K2. Haplogroup N (M231) is found through northern Eurasia, especially among the Uralic peoples. Haplogroup N possibly originated in eastern Asia and spread both northward and westward into Siberia, being the most common group found in some Uralic speaking peoples. Haplogroup O (M175) is found with its highest frequency in East Asia and Southeast Asia, with lower frequencies in the South Pacific, Central Asia, South Asia, and islands in the Indian Ocean (e.g. Madagascar, the Comoros). No examples of the basal paragroup K2b1* have been identified. Males carrying subclades of K2b1 are found primarily among Papuan peoples, Micronesian peoples, indigenous Australians, and Polynesians. Haplogroup M (P256) also known as K2b1b: found in New Guinea and Melanesia. Haplogroup P (P295) has two primary branches: P1 (P-M45) and the extremely rare P2 (P-B253). P*, P1* and P2 are found together only on the island of Luzon, in The Philippines. In particular, P* and P1* are found at significant rates among members of the Aeta (or Agta) people of Luzon. While, P1* is now more common among living individuals in Eastern Siberia and Central Asia, it is also found at low levels in mainland South East Asia and South Asia. Considered together, these distributions tend to suggest that P* emerged from K2b in South East Asia. Haplogroup R (R-M207). These share the common marker M45 in addition to at least 18 other SNPs. The hypothetical divergence of Haplogroup R and its descendants. Haplogroup R is defined by the SNP M207. 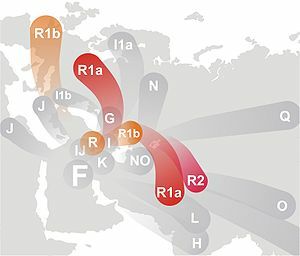 The bulk of Haplogroup R is represented in descendant subclade R1 (M173), which likely originated on the Eurasian Steppes. R1 has two descendant subclades: R1a and R1b. R1a is associated with the proto-Indo-Iranian and Balto-Slavic peoples, and is now found primarily in Central Asia, South Asia, and Eastern Europe. Haplogroup R1b is the dominant haplogroup of Western Europe and also found sparsely distributed among various peoples of Asia and Africa. Its subclade R1b1a2 (M269) is the haplogroup that is most commonly found among modern Western European populations, and has been associated with the Italo-Celtic and Germanic peoples. ^ Kivisild, T.; Rootsi, S.; Metspalu, M.; Mastana, S.; Kaldma, K.; Parik, J.; Metspalu, E.; Adojaan, M.; Tolk, H. V.; Stepanov, V.; Gölge, M.; Usanga, E.; Papiha, S. S.; Cinnioğlu, C.; King, R.; Cavalli-Sforza, L.; Underhill, P. A.; Villems, R. (2003). "The Genetic Heritage of the Earliest Settlers Persists Both in Indian Tribal and Caste Populations". American Journal of Human Genetics. 72 (2): 313–332. doi:10.1086/346068. PMC 379225. PMID 12536373. ^ a b "Understanding Haplogroups: How are the haplogroups named?". Family Tree DNA. Archived from the original on 21 June 2012. Retrieved 31 March 2013. ^ Dolgin, Elie (2009). "Human mutation rate revealed". Nature. doi:10.1038/news.2009.864. Retrieved 18 September 2017. "one mutation in every 30 million base pairs"
^ Karmin; et al. (2015). "A recent bottleneck of Y chromosome diversity coincides with a global change in culture". Genome Research. 25 (4): 459–66. doi:10.1101/gr.186684.114. PMC 4381518. PMID 25770088. "we date the Y-chromosomal most recent common ancestor (MRCA) in Africa at 254 (95% CI 192–307) kya and detect a cluster of major non-African founder haplogroups in a narrow time interval at 47–52 kya, consistent with a rapid initial colonization model of Eurasia and Oceania after the out-of-Africa bottleneck. In contrast to demographic reconstructions based on mtDNA, we infer a second strong bottleneck in Y-chromosome lineages dating to the last 10 ky. We hypothesize that this bottleneck is caused by cultural changes affecting variance of reproductive success among males." ^ a b c d e f g h i j k l m n o p q r s t u v w x y z aa ab ac ad ae af ag ah ai aj ak al am an ao ap "YFull YTree". YFull. Retrieved 15 September 2017. ^ "Understanding Results: Y-DNA Single Nucleotide Polymorphism (SNP): What is a Y-chromosome DNA (Y-DNA) haplogroup?". Family Tree DNA. Retrieved 31 March 2013. Y-chromosome DNA (Y-DNA) haplogroups are the major branches on the human paternal family tree. Each haplogroup has many subbranches. These are subclades. ^ "myFTDNA 2.0 User Guide: Y-DNA: What is the Y-DNA – Matches page?". Family Tree DNA. Retrieved 31 March 2013. A terminal SNP determines the terminal (final) subbranch on the Y-DNA Tree to which someone belongs. ^ "Understanding Results: Y-DNA Single Nucleotide Polymorphism (SNP): How are haplogroups and their subclades named?". Family Tree DNA. Retrieved 31 March 2013. ^ "Family Tree DNA – Genetic Testing for Ancestry, Family History & Genealogy". familytreedna.com. ^ a b Copyright 2015 ISOGG. "ISOGG 2015 Y-DNA Haplogroup Tree Trunk". isogg.org. ^ Chuan-Chao Wang; Li Hui (2014-05-03). "Comparison of Y-chromosomal lineage dating using either evolutionary or genealogical Y-STR mutation rates". bioRxiv 004705. ^ a b Karafet, TM; Mendez, FL; Meilerman, MB; Underhill, PA; Zegura, SL; Hammer, MF (2008). "New binary polymorphisms reshape and increase resolution of the human Y chromosomal haplogroup tree". Genome Research. 18 (5): 830–38. doi:10.1101/gr.7172008. PMC 2336805. PMID 18385274. ^ a b Chiaroni, Jacques; Underhill, Peter A.; Cavalli-Sforza, Luca L. (1 December 2009). "Y chromosome diversity, human expansion, drift, and cultural evolution". Proceedings of the National Academy of Sciences of the United States of America. 106 (48): 20174–79. doi:10.1073/pnas.0910803106. PMC 2787129. PMID 19920170. ^ Tumonggor, Meryanne K (2014). "Isolation, contact and social behavior shaped genetic diversity in West Timor". Journal of Human Genetics. 59 (9): 494–503. doi:10.1038/jhg.2014.62. PMC 4521296. PMID 25078354. ^ This was, for instance, the case with the original subclade F3 (M96), which has since been renamed Haplogroup H2. ^ Passarino G, Cavalleri GL, Lin AA, Cavalli-Sforza LL, Børresen-Dale AL, Underhill PA (2002). "Different genetic components in the Norwegian population revealed by the analysis of mtDNA and Y chromosome polymorphisms". European Journal of Human Genetics. 10 (9): 521–29. doi:10.1038/sj.ejhg.5200834. PMID 12173029. ^ Karlsson, Andreas O; Wallerström, Thomas; Götherström, Anders; Holmlund, Gunilla (2006). "Y-chromosome diversity in Sweden – A long-time perspective". European Journal of Human Genetics. 14 (8): 963–70. doi:10.1038/sj.ejhg.5201651. PMID 16724001. ^ Nogueiro, Inês (2009). "Phylogeographic analysis of paternal lineages in NE Portuguese Jewish communities". American Journal of Physical Anthropology. 141 (3): 373–81. doi:10.1002/ajpa.21154. PMID 19918998. ^ a b ISOGG, 2016, Y-DNA Haplogroup P and its Subclades – 2016 (20 June 2016). ^ a b Tumonggor, Meryanne K; Karafet, Tatiana M; Downey, Sean; Lansing, J Stephen; Norquest, Peter; Sudoyo, Herawati; Hammer, Michael F; Cox, Murray P (31 July 2014). "Isolation, contact and social behavior shaped genetic diversity in West Timor". Journal of Human Genetics. 59 (9): 494–503. doi:10.1038/jhg.2014.62. PMC 4521296. PMID 25078354. ^ Tatiana M Karafet; et al. (2015). "Improved phylogenetic resolution and rapid diversification of Y-chromosome haplogroup K-M526 in Southeast Asia". European Journal of Human Genetics. 23 (3): 369–73. doi:10.1038/ejhg.2014.106. PMC 4326703. PMID 24896152. ^ Zegura, S. L.; Karafet, TM; Zhivotovsky, LA; Hammer, MF (2003). "High-Resolution SNPs and Microsatellite Haplotypes Point to a Single, Recent Entry of Native American Y Chromosomes into the Americas" (PDF). Molecular Biology and Evolution. 21 (1): 164–75. doi:10.1093/molbev/msh009. PMID 14595095. ^ Sharma, Swarkar; Rai, Ekta; Bhat, Audesh K; Bhanwer, Amarjit S; Bamezaicorresponding, Rameshwar NK (2007). "A novel subgroup Q5 of human Y-chromosomal haplogroup Q in India". BMC Evol Biol. 7: 232. doi:10.1186/1471-2148-7-232. PMC 2258157. PMID 18021436. ^ Hallast, P.; Batini, C.; Zadik, D.; Maisano Delser, P.; Wetton, J. H.; Arroyo-Pardo, E.; Cavalleri, G. L.; De Knijff, P.; Destro Bisol, G.; Dupuy, B. M.; Eriksen, H. A.; Jorde, L. B.; King, T. E.; Larmuseau, M. H.; Lopez De Munain, A.; Lopez-Parra, A. M.; Loutradis, A.; Milasin, J.; Novelletto, A.; Pamjav, H.; Sajantila, A.; Schempp, W.; Sears, M.; Tolun, A.; Tyler-Smith, C.; Van Geystelen, A.; Watkins, S.; Winney, B.; Jobling, M. A. (2015). "The Y-Chromosome Tree Bursts into Leaf: 13,000 High-Confidence SNPs Covering the Majority of Known Clades". Molecular Biology and Evolution. 32 (3): 661–673. doi:10.1093/molbev/msu327. PMC 4327154. PMID 25468874. ^ Di Cristofaro, Julie; Pennarun, Erwan; Mazières, Stéphane; Myres, Natalie M.; Lin, Alice A.; Temori, Shah Aga; Metspalu, Mait; Metspalu, Ene; Witzel, Michael; King, Roy J.; Underhill, Peter A.; Villems, Richard; Chiaroni, Jacques (2013). "Afghan Hindu Kush: Where Eurasian Sub-Continent Gene Flows Converge". PLOS ONE. 8 (10): e76748. doi:10.1371/journal.pone.0076748. PMC 3799995. PMID 24204668. ^ Wen B, Li H, Lu D, et al. (September 2004). "Genetic evidence supports demic diffusion of Han culture". Nature. 431 (7006): 302–05. doi:10.1038/nature02878. PMID 15372031. ^ Wells RS, Yuldasheva N, Ruzibakiev R, et al. (August 2001). "The Eurasian heartland: a continental perspective on Y-chromosome diversity". Proc. Natl. Acad. Sci. U.S.A. 98 (18): 10244–49. doi:10.1073/pnas.171305098. PMC 56946. PMID 11526236. ^ Bortolini MC, Salzano FM, Thomas MG, et al. (September 2003). "Y-chromosome evidence for differing ancient demographic histories in the Americas". Am. J. Hum. Genet. 73 (3): 524–39. doi:10.1086/377588. PMC 1180678. PMID 12900798. ^ Batini, Chiara; Hallast, Pille; Zadik, Daniel; Delser, Pierpaolo Maisano; Benazzo, Andrea; Ghirotto, Silvia; Arroyo-Pardo, Eduardo; Cavalleri, Gianpiero L.; De Knijff, Peter; Dupuy, Berit Myhre; Eriksen, Heidi A.; King, Turi E.; De Munain, Adolfo López; López-Parra, Ana M.; Loutradis, Aphrodite; Milasin, Jelena; Novelletto, Andrea; Pamjav, Horolma; Sajantila, Antti; Tolun, Aslıhan; Winney, Bruce; Jobling, Mark A. (2015). "Large-scale recent expansion of European patrilineages shown by population resequencing". Nature Communications. 6: 7152. doi:10.1038/ncomms8152. PMC 4441248. PMID 25988751. ^ "The father of all men is 340,000 years old". ^ a b c Semino, O; Magri, C; Benuzzi, G; et al. (May 2004). "Origin, diffusion, and differentiation of Y-chromosome haplogroups E and J: inferences on the neolithization of Europe and later migratory events in the Mediterranean area". Am. J. Hum. Genet. 74 (5): 1023–34. doi:10.1086/386295. PMC 1181965. PMID 15069642. ^ a b c d e f g Trombetta, Beniamino; d'Atanasio, Eugenia; Massaia, Andrea; Ippoliti, Marco; Coppa, Alfredo; Candilio, Francesca; Coia, Valentina; Russo, Gianluca; Dugoujon, Jean-Michel; Moral, Pedro; Akar, Nejat; Sellitto, Daniele; Valesini, Guido; Novelletto, Andrea; Scozzari, Rosaria; Cruciani, Fulvio (2015). "Phylogeographic Refinement and Large Scale Genotyping of Human y Chromosome Haplogroup e Provide New Insights into the Dispersal of Early Pastoralists in the African Continent". Genome Biology and Evolution. 7 (7): 1940–1950. doi:10.1093/gbe/evv118. PMC 4524485. PMID 26108492. ^ a b Shi, Hong; Qi, Xuebin; Zhong, Hua; Peng, Yi; Zhang, Xiaoming; Ma, Runlin Z.; Su, Bing (2013). "Genetic Evidence of an East Asian Origin and Paleolithic Northward Migration of Y-chromosome Haplogroup N". PLOS ONE. 8 (6): e66102. doi:10.1371/journal.pone.0066102. PMC 3688714. PMID 23840409. ^ a b Rootsi, Siiri; et al. (2004). "Phylogeography of Y-Chromosome Haplogroup I Reveals Distinct Domains of Prehistoric Gene Flow in Europe" (PDF). American Journal of Human Genetics. 75 (1): 128–37. doi:10.1086/422196. PMC 1181996. PMID 15162323. ^ a b P.A. Underhill, N.M. Myres, S. Rootsi, C.T. Chow, A.A. Lin, R.P. Otillar, R. King, L.A. Zhivotovsky, O. Balanovsky, A. Pshenichnov, K.H. Ritchie, L.L. Cavalli-Sforza, T. Kivisild, R. Villems, S.R. Woodward, New Phylogenetic Relationships for Y-chromosome Haplogroup I: Reappraising its Phylogeography and Prehistory, in P. Mellars, K. Boyle, O. Bar-Yosef and C. Stringer (eds. ), Rethinking the Human Evolution (2007), pp. 33–42. ^ a b Sharma, Swarkar; Rai, Ekta; Sharma, Prithviraj; Jena, Mamata; Singh, Shweta; Darvishi, Katayoon; Bhat, Audesh K.; Bhanwer, A J S.; Tiwari, Pramod Kumar; Bamezai, Rameshwar N K. (2009). "The Indian origin of paternal haplogroup R1a1* substantiates the autochthonous origin of Brahmins and the caste system". Journal of Human Genetics. 54 (1): 47–55. doi:10.1038/jhg.2008.2. PMID 19158816. ^ Jones, Eppie R.; Gonzalez-Fortes, Gloria; Connell, Sarah; Siska, Veronika; Eriksson, Anders; Martiniano, Rui; McLaughlin, Russell L.; Gallego Llorente, Marcos; Cassidy, Lara M.; Gamba, Cristina; Meshveliani, Tengiz; Bar-Yosef, Ofer; Müller, Werner; Belfer-Cohen, Anna; Matskevich, Zinovi; Jakeli, Nino; Higham, Thomas F. G.; Currat, Mathias; Lordkipanidze, David; Hofreiter, Michael; Manica, Andrea; Pinhasi, Ron; Bradley, Daniel G. (2015). "Upper Palaeolithic genomes reveal deep roots of modern Eurasians". Nature Communications. 6: 8912. doi:10.1038/ncomms9912. PMC 4660371. PMID 26567969. ^ Evatt, Danny (2013-11-01). "The Evatt Clan: A Worldwide Historical Review of the Evatt Family Surname". ^ Sjödin, Per; François, Olivier (2011). "Wave-of-Advance Models of the Diffusion of the y Chromosome Haplogroup R1b1b2 in Europe". PLOS ONE. 6 (6): e21592. doi:10.1371/journal.pone.0021592. PMC 3123369. PMID 21720564. ^ a b Underhill, Peter A.; Myres, Natalie M.; Rootsi, Siiri; Metspalu, Mait; Zhivotovsky, Lev A.; King, Roy J.; Lin, Alice A.; Chow, Cheryl-Emiliane T.; Semino, Ornella; Battaglia, Vincenza; Kutuev, Ildus; Järve, Mari; Chaubey, Gyaneshwer; Ayub, Qasim; Mohyuddin, Aisha; Mehdi, S Qasim; Sengupta, Sanghamitra; Rogaev, Evgeny I.; Khusnutdinova, Elza K.; Pshenichnov, Andrey; Balanovsky, Oleg; Balanovska, Elena; Jeran, Nina; Augustin, Dubravka Havas; Baldovic, Marian; Herrera, Rene J.; Thangaraj, Kumarasamy; Singh, Vijay; Singh, Lalji; et al. (2010). "Separating the post-Glacial coancestry of European and Asian y chromosomes within haplogroup R1a". European Journal of Human Genetics. 18 (4): 479–484. doi:10.1038/ejhg.2009.194. PMC 2987245. PMID 19888303. Mendez, Fernando; Krahn, Thomas; Schrack, Bonnie; Krahn, Astrid-Maria; Veeramah, Krishna; Woerner, August; Fomine, Forka Leypey Mathew; Bradman, Neil; Thomas, Mark; Karafet, Tatiana M.; Hammer, Michael F. (7 March 2013). "An African American paternal lineage adds an extremely ancient root to the human Y chromosome phylogenetic tree" (PDF). American Journal of Human Genetics. 92 (3): 454–9. doi:10.1016/j.ajhg.2013.02.002. PMC 3591855. PMID 23453668. Wikimedia Commons has media related to Human Y-DNA haplogroups.